Home Japan Is It Time For Japanese Real Estate? Like the Tokyo stock market, the Japanese property market has seen many false dawns since the country’s boom years ended at the start of the nineties. Now Japanese markets seem to have bottomed out finally and yet investors are still wary of disappointment. In the context of property investments a lot of significance has been attached to Japanese real estate investment trusts (REITs). Given the moribund state of Japan’s bank credit over so many years REITs have been seen as a welcome way for property holders to obtain some leverage and to get their investments working as collateral in a way that the banks hadn’t seemed prepared to encourage. MoneyWeek comments that funds such as Japan Retail Fund and Japan Real Estate Investment Corporation can be bought through the likes of Barclays Stockbrokers. Writing in the Motley Fool, Dan Caplinger highlights that property prices tend not to correlate with share prices as an attraction for investors in Japan. However, it should be remember that Japanese property did correlate substantially with other types of investment during the 15-year recession. Evidence of a recovering property market can be seen in the Ministry of Land, Infrastructure and Transport’s land price index has risen for the first time in 16 years.Last year the Topix Real Estate Index gained 6.5%. The vacancy rates in Tokyo’s Marunouchi business district are only just over 2% for new developments. 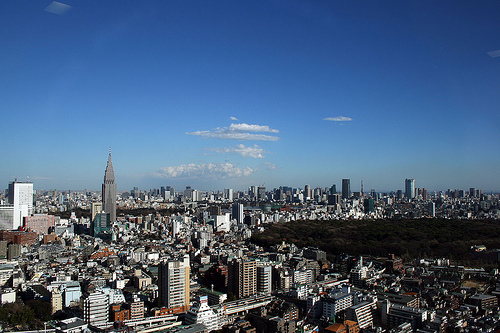 Among Japanese property companies Sumitomo Realty’s share price rose 39%. Incidentally, many UK investment funds include Japanese property (and construction) companies in their portfolios. Hargreaves Lansdown lists some 70 Japan funds that have a property component. For a purer property investment Everbank of the US are offering CDs that offer a return based on the performance of the Japanese REIT index, the 3.5-Year MarketSafe Japanese Real Estate Investment Trusts (REIT) Certificate of Deposit. There are now 37 REITs quoted on the Tokyo Stock Exchange REIT Index and the average PER is over 30 compared to an average PER of 25 for the Nikkei. Commentators differ as to whether new investors have already missed the boat or if this is just the beginning of a long-running surge. Other factors to consider in taking a view on Japan’s real estate market are, negatively, the heavy dependence of the economy on continued growth in China, the adverse demographic trends and the fact that Tokyo is expensive relative to other top financial centres (though not as expensive as London’s West End). On the positive side a lot of Japan’s housing stock is due for renewal in the next few years and home buyers pay very low rates of interest compared to the US or UK. Generally, the optimists are looking at property prices (going up) and the pessimists at rental yields (going down). Given the extraordinary deflationary problems of the Japanese economy since 1991 it seems sensible to view the current trend as a return to normality rather than the start of a fully fledged boom. It could be more of a tsunami than a case of gently rising sea levels.